In our previous Weekly note, we had mentioned about NIFTY staying within a specified range and not seeing any runaway rally. 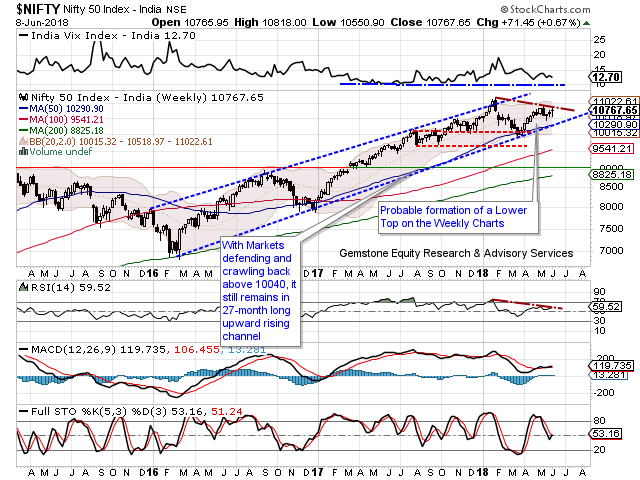 In line with this analysis, the Index oscillated in a defined range and ended the Week with a modest gain of 71.45 points or 0.67% on week-on-week basis. The week that went by saw the NIFTY staying within the falling trend line which has defined a probable lower top for the Markets. In the coming Week, the NIFTY will set aside its reactions that it had to the RBI Monetary Policy review that saw the Repo Rate increasing by 25 bps and Reverse Repo Rate at 6%. In the new Week, the focus will be to see if the NIFTY manages to move past its falling trend line which defines a lower top for the Markets. The levels of 10820-10850 will now assume critical importance as the levels to watch out for in the next week. The coming week will see the levels of 10850 and 10975 acting as immediate resistance area for the Markets. Supports come in lower at 10550 and 10510 zones. The Relative Strength Index – RSI on the Weekly Chart is 59.5185. It remains neutral showing no divergence against the price. It is also forming a pattern which confirms with the price pattern on the NIFTY while forming lower tops. The Weekly MACD stays bullish while trading above its signal line. On the Candles, a candle with a long lower shadow emerged. It becomes significant as it has occurred near the pattern area resistance of a falling trend line joining the lower tops. It lends credibility to the mentioned resistance area. Overall, for any meaningful uptrend to resume, NIFTY will have to move past the 10820-10850 area and move out of a falling trend line that is forming the lower tops for the Markets. Until that happens, the defined zone of 10820-10850 will continue to resist the Markets. The F&O data suggest that we will see more of a consolidation rather than any major downsides due the shorts that still exist in the system. 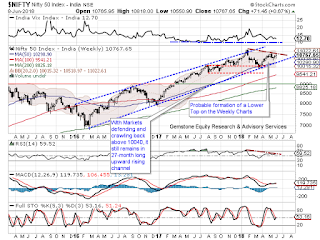 We recommend continuing to buy the dips while remaining very much vigilant at higher levels until the NIFTY moves past 10850-mark. 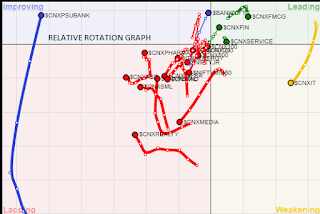 The coming Week is set to remain highly stock and sector specific in nature. A study of Relative Rotation Graphs – shows PSU Banks have significant improved on its relative momentum and will be seen attempting to outperform the general Markets and is very likely to be accompanied by BankNifty pack as well. Besides this, FMCG and Financial Services are still set to relatively out-perform the general Markets and provide leadership in event of any major up move. Broader Indices like CNX100, CNX200, CNX500, NIFTY Next 50, MidCaps, etc. are still seen deteriorating on the momentum front and this may be enough reason to prevent general Markets from any runaway up move. AUTO Pack too has lost much on the momentum front and is not expected to put up any distinct show. Stock specific out-performances can be expected from METAL, REALTY and PHARMA Packs.